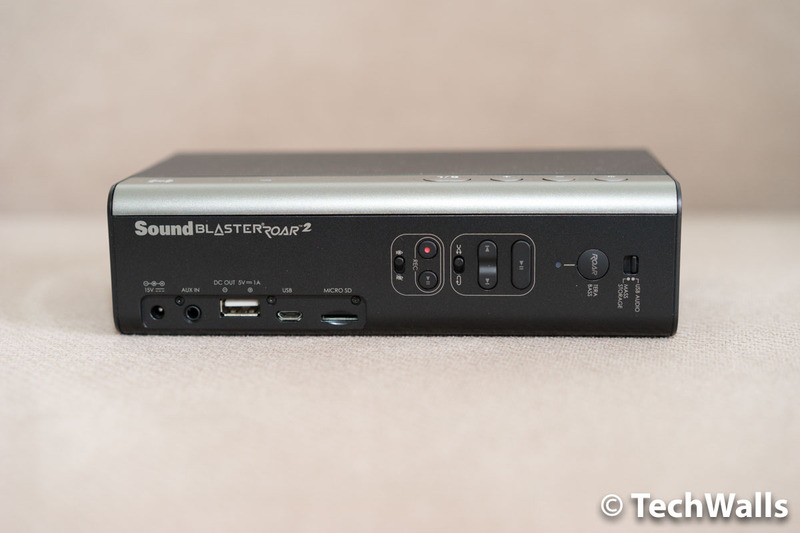 The original Creative Sound Blaster was released 2 years ago but it is still a successful product on Amazon with very high ratings from thousands of reviewers. I didn’t test the original version but now I have a chance to try the newer Creative Sound Blaster Roar 2. Let’s see why customers are so satisfied with the portable speaker. The Creative product has simple packaging and contents inside the box. There are just the speaker, a micro USB cable, a power adapter, user manual and 2 front rubber stickers. You can either lay the speaker flat on your desk or use the rubber feet to place it upright with drivers heading towards our ears. The design of the new version was refined and it is already 20% smaller and 0.3 lbs lighter than its predecessor. However, it is still not as small and lightweight as some other portable speakers. You can’t put it in your pant pocket but it will easily fit into any bag. The exterior is a combination of plastic and aluminum. It doesn’t look like a stylish product but the build quality is great. When I took it out of the box, I immediately felt the weight of the compact speaker. Notice that the speaker is not dust or water resistant, so you should be extremely careful if you bring it to the beach. A notable change over the first generation is the placement of drivers. The speaker still houses 5 drivers inside, including 2 passive radiators on 2 sides, however, all other drivers head upwards when you lay the speaker down. That’s the reason why the metal grille covers the top of the speaker only. 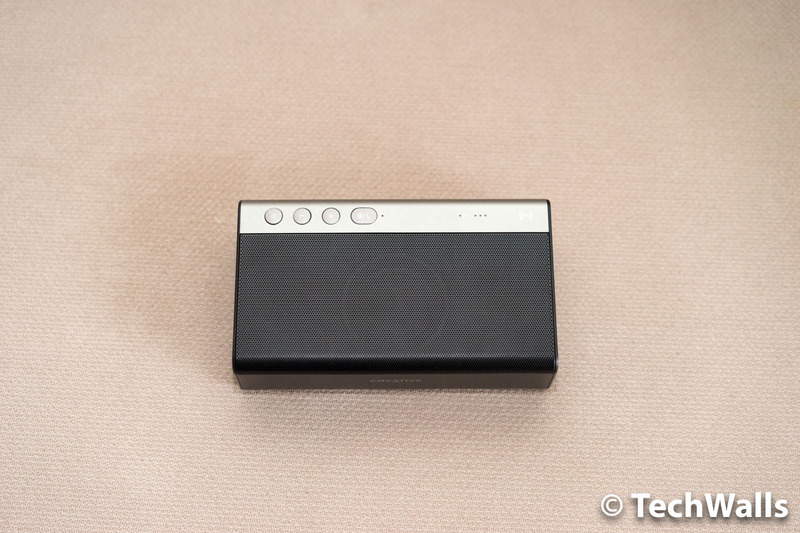 The Sound Blaster Roar 2 is the most complicated Bluetooth speaker I’ve tested for a while as it is packed with a lot of features. That’s why you see more buttons and connections on the speaker. The top of the speaker looks normal with some buttons like Power button, volume rocker, multifunction button and some indicator lights. A lot more ports and buttons are placed on the back of the speaker. You can find the proprietary power port, AUX in, DC out (USB 1.0A), a microUSB port, a microSD slot, recording controls, MP3 playback buttons, Roar / TeraBass button and USB Audio / Mass Storage mode switch. You can see their functionalities in the video on top. Basically, the Roar 2 can stream music wirelessly via Bluetooth, charge your smartphone, play music from your computer, from a microSD card, work as a microSD card reader, an audio recorder, and a speakerphone. I really love the built-in MP3 player, unfortunately, it can play MP3, WMA and WAV files only. This is a shame because I have just M4A and FLAC files in my music collection. I really love the built-in MP3 player, unfortunately, it can play MP3, WMA and WAV files only. This is a shame because I have just M4A and FLAC files in my music collection. Another nice feature is audio recorder but quality of the microphone is just acceptable, so it should be used to record phone calls or voice only. Another downside of the Roar is that it hasn’t supported Bluetooth 4.0. Therefore, the battery life is shorter than I expected, the 6000mAh Li-ion battery could last about 7-8 hours in my test. Fortunately, this won’t affect audio quality as the speaker supports aptX and AAC high-definition codecs, and A2DP for streaming stereo-quality audio via Bluetooth. Before testing the Roar 2, I tried some other Bluetooth speakers in the sub-$100 price range. All of those speakers have serious issues in sound quality, therefore, I felt so relieved when I turned on the Roar 2 because I could fall in love with music once again. Before diving deeper into sonic characteristics, you can watch the video below to get an idea of the sound signature and different modes of the speaker. I prefer using the speaker in horizontal placement because the sound becomes deeper and more spacious in the position and I don’t really need to use buttons on the back. I was not aware that the Roar 2 has 3 different sound modes. When I used the speaker for the first time, I left it in the default mode and played music in a large room. So, I was a little disappointed because the sound was not mind blowing like many reviewers praised. Everything has changed since I switched to the TeraBass, and then Roar mode. Now I often turn on Terabass mode when I play music in my small bedroom and switch to Terabass with Roar mode when I use it outdoors or in larger rooms. Basically, the Terabass feature will boost the bass at low-level listening conditions without artificially over accentuating bass levels and the Roar mode will boost the loudness and soundstage of the audio. You really should switch between those modes to find the ideal one for your environment. The speaker is a lot more powerful when it is plugged in. If you need a louder sound, I recommend you to plug it into a power outlet because it will boost the volume level. The speaker will be about 10% louder without affecting the sound signature. The only problem of the sound is that there is a little distortion in roar mode when I crank up the volume. Obviously, the drivers are not powerful enough to produce clear mids and highs at high volume level. If you hear the distortion, you can turn volume down or switch back to Terabass mode to keep enjoying music. I am very impressed with the great soundstage, punchy bass and clear mids of the Roar 2. The music is a lot more enjoyable than the muddy sound on Bose Soundlink Mini and the speaker can become a tough competition for more expensive Bluetooth speakers. 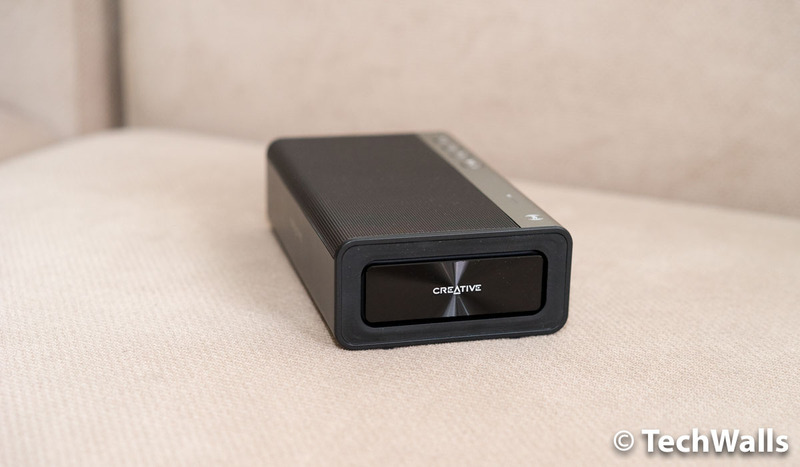 The Creative Sound Blaster Roar 2 has become one of my favorite Bluetooth speakers. You will be able to enjoy a great sound without breaking your wallet, therefore, I highly recommend the product. Best portable speaker for the price.